When our 3rd Annual Create-a-Greeting-Card Scholarship winner Lauren Ondreko was announced, it was met with much celebration and a little bit of controversy as well. Lauren created a beautiful line drawing that features all the things that make the Christmas season great – snowmen, presents, ornaments, holly, and even stars. The drawing will make a perfect personalized Christmas cards design, but it was submitted on a piece of loose-leaf. That fact caused quite a buzz after the winner was announced. However, her design was graceful and truly in the spirit of the season. Lauren’s artwork really knocked it out of the park. Lauren is a senior at Friendswood High School in Friendswood, Texas. She is the first high school student to win the scholarship contest. Past winners have all been college students, so Lauren is breaking new ground! Her Christmas card creation made her a winner, but she also is planning on pursuing a degree in Elementary Education/Special Needs, so it looks like her future students are going to be winners as well! Lauren isn’t just a wonderful artist; she is also incredibly gracious. 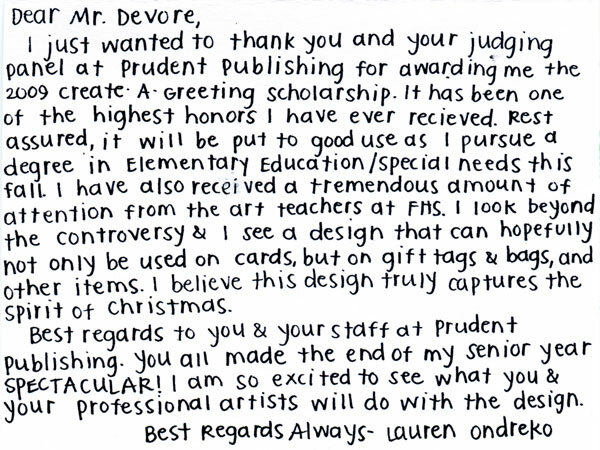 When Lauren discovered that she had won the scholarship, she created handmade, customized thank you cards. She sent these lovely pieces of art to our company, and everyone was thrilled by just how talented Lauren truly is. 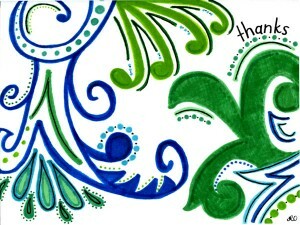 These thank you cards feature the same type of beautiful line work that won her the scholarship in the first place. They also showcase what a thoughtful and determined young woman Lauren is. Getting the chance to see some of her designs on those thank you cards also made everyone very excited for the Christmas card she designed. 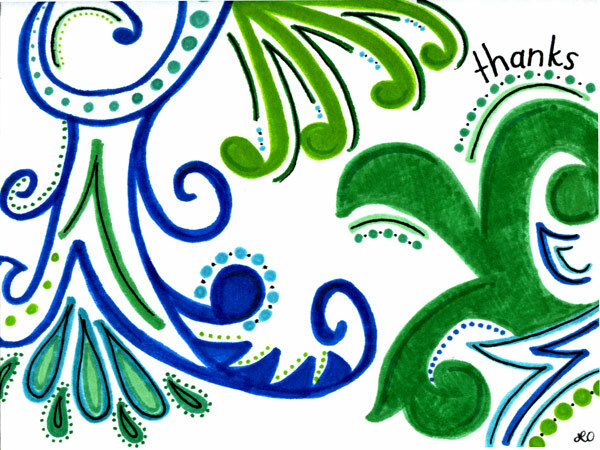 Lauren Ondreko, the 3rd annual greeting card scholarship winner, designed this thank you note. Lauren also wrote a gracious personalized message on the inside of her thank you card. The Create-a-Greeting-Card Scholarship Contest has many rewards. Lauren received a $10,000 scholarship, and Friendswood High School also received $1,000. But more than that, Lauren’s artwork will be made into gorgeous Christmas cards that people all over the world will be sending to their friends and family. The chance to have your artwork produced for people across the globe to see is a thrill for any artist. 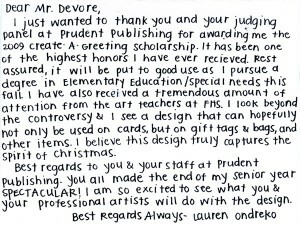 Lauren’s holiday cards will spread cheer to everyone, and that prize is just as important and exciting as the scholarship itself. The Create-a-Greeting-Card Scholarship Contest gives young artists the chance to have their artwork produced on beautiful, finely crafted greeting cards as well as a chance to further their education. Lauren Ondreko’s design will be made into stunning personalized Christmas cards, and some of the burden of paying for college will be lifted. We couldn’t be more pleased with our choice, and Lauren couldn’t be more pleased either. So if you are thinking about entering the scholarship contest, go for it! Lauren is certainly happy that she did.